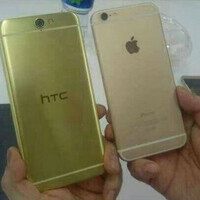 HTC One A9 mid-range specs confirmed by AnTuTu? Anyone holding out hope that the HTC One A9 will be a high-end handset will be sorry to see the specs revealed when the device ran through an AnTuTu benchmark test. According to AnTuTu, the HTC One A9 will feature a 5-inch screen with a 1080 x 1920 resolution. That works out to a 441ppi pixel density. The benchmark site shows that a Snapdragon 620 chipset is under the hood. However, A previous tweet from Evan Blass indicated that the Snapdragon 617 SoC would be under the hood. That chip comes with the Adreno 405 GPU, making it more likely that the One A9 is packing the latter chipset. The specs also show 3GB of RAM is inside, along with 32GB of native storage. A 13MP camera adorns the back while a 5MP selfie shooter graces the front of the phone. The One A9 scored 40,698 on AnTuTu, not exactly a score associated with a powerful handset. The phone could be a major disappointment to HTC fans and others who were expecting to see the manufacturer unveil a new flagship phone. Instead, that appears to be the 6-inch HTC O2 which is expected to be launched next year, powered by the Snapdragon 820 chipset. Since this information is unofficial, it might be best to take it with a grain of salt. Yeah this is true. A 620 wouldn't give out a score like that. HTC fell off! Htc just launched m9 last march 2015 so I am quite intrigued why some people are disappointed if they release a mid-ranger this month? If they release high-end phone every march and september, they'll just choke to death with the expenses involved in creating flagships. 2 or 3 years htc, you gotta recuperate and let the big boys play the premium bracket before going back. Plan everything so you can be confident on improving your device. They don't have that luxury. The investors are buying into the HTC makes quality products the fans and media are concocting and they still think it's just marketing they need when in reality they need to be rebuilt from the ground up and need to make wholesale staffing changes to cut the dead weight and a fresh perspective from the high level management. It's fake. Snapdragon 620 = Adreno 510. Do some research next time. By using cortex a72 it will score pretty well, the benchmarks score and the information is irreliable. However this specs r not midrange its upper mid range. It can give competition to Galaxy a7 and a8.